One staple of meals with my life mate/soul mate were salads. 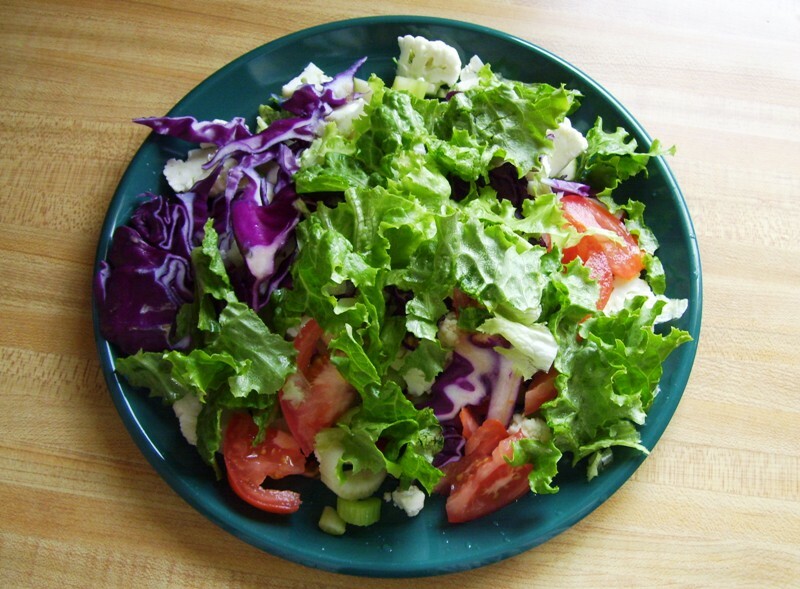 During our decades together, we always tried to eat plenty of raw vegetables, so our salads weren’t puny affairs with a few bits of vegetables and lots of iceberg lettuce. We used as many colors as we could — red tomatoes, purple cabbage, yellow squash, orange carrots, white cauliflower, green leaf lettuce. Since the salads were a time-consuming affair, we usually worked together, he washing the vegetables, me cutting them up. I don’t remember much of the last year of his life (except for the last six weeks — those I remember). After he died I was in too much pain to recall that year, and now it’s too far in the past to recover the details. But I do remember a time when I came in late from my walk, and he’d already fixed a salad for us. This was shortly before he got too sick to do anything but try to stay ahead of the pain. I don’t understand where he got the energy to fix the salad — his poor body was so ridden with metastases, it must have taken everything he had to do the simplest task, and yet, the salad was waiting for me when I got in. Yesterday I mentioned how I carelessly let that last year slip by, how I didn’t hang on to his every word, but I was careful that day and took a photo of the salad, perhaps the last one he ever made for me. I wanted the picture because the plate was beautiful, not as a memory of him, but still, it showed I was paying attention to the good things in our shared life. It seems impossible that he’s been gone for almost three and a half years. Seems impossible that our salad days are over and all that remains is this simple photo. This is beautiful! My soul mate and life partner and I always try to make nice colourful salads also. This is a simple but beautiful tribute to him! Hugs! Thank you. I’m trying to remember the good times. There are so many memories tinged with pain, it’s good to have something to think about that’s all good. The painful memories have a way of making the good ones extra sweet. I’m glad you have some just good ones to reflect on.